DJ Denim Danger, DJ Dos Tres, DJ Emmi Lemmi, DJ E.T.B, DJ O.T., DJ Rojo, DJ Saracha, DJ Young Jean, and Mr. L, the instructor and producer of the show. Listed below you will find our shows. Just click on the name of the show to listen. We hope you enjoy the show! Thanks for listening. The April 19, 2019 edition of Lunch Break, the Norwood High School student radio show which airs on KOTO Radio, 105.3 FM. Catch the show live at 12:05pm every Firday. The April 12, 2019 edition of Lunch Break, the Norwood High School student radio show which airs on KOTO Radio, 105.3 FM. Catch the show live at 12:05pm every Firday. This is Episode 11 the April 5th edition of Lunch Break. Note: Episode 10 was done live and we don't have the recording for it. 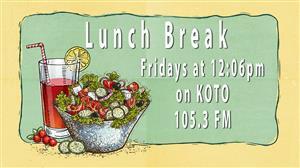 Lunch Break is the Norwood High School student radio show which airs on KOTO Radio, 105.3 FM. Catch the show live at 12:05pm every Firday. The March 22nd edition of Lunch Break, the Norwood High School student radio show which airs on KOTO Radio, 105.3 FM. Catch the show live at 12:05pm every Firday. The March 15th edition of Lunch Break, the Norwood High School student radio show which airs on KOTO Radio, 105.3 FM. Catch the show live at 12:05pm every Firday. The March 8th edition of Lunch Break, the Norwood High School student radio show which airs on KOTO Radio, 105.3 FM. Catch the show live at 12:05pm every Firday. The March 1st edition of Lunch Break, the Norwood High School student radio show which airs on KOTO Radio, 105.3 FM. Catch the show live at 12:05pm every Firday. (NOTE: Due to KOTO Winter fundraiser there was no Lunch Break show on February 22nd). This is a special Valentine's Week episode featuring a special interview with Gene and Darlene Rummel discussing their 60+ years of marriage and an original song by Mr. Lawrence. The February 8th edition of Lunch Break, the Norwood High School student radio show which airs on KOTO Radio, 105.3 FM. Catch the show live at 12:05pm every Firday. Norwood High School's student radio program, Lunch Break, which aired on KOTO Radio, 105.3 FM on February 1, 2019. Norwood High School's student radio program, Lunch Break, for January 25, 2019. This is our first Lunch Break show. It aired on KOTO Radio in Telluride (105.3 FM in Norwood) on January 18, 2019. As part of our Lunch Break show Mr. L has a segment called Old Days. Below are Mr. L's Old Days show segments from each week. Mr. L's Old Days segment from April 19, 2019. This segment features "Sunshine on my Shoulders" by John Denver. Mr. L's Old Days segment from April 12, 2019. This segment features "Southern Nights" by Glen Campbell. Mr. L's Old Days segment from April 5, 2019. This segment features "Convoy" by C.W. McCall. (NOTE: Show #10 on March 29th was done live and there was no Old Days segment on that show). Mr. L's Old Days segment from March 22, 2019. This segment features "The Loco-motion" by Grand Funk Railroad. Mr. L's Old Days segment from March 18, 2019. This segment features "You're the One that I Want" by Olivia Newton John and John Trevolta. Mr. L's Old Days segment from March 8, 2019. This segment features "Dancing Queen" by ABBA. Mr. L's Old Days segment from February 15, 2019. This segment includes "Welcome Back" by John Sebastian. Mr. L's Old Days segment from February 15, 2019. This episode features an original song by Mr. L titled After 25 Years Together. Mr. L's Old Days segment from February 8, 2019. This episode features Stayin' Alive by the BeeGees. Mr. L's Old Days segment from February 1, 2019. This episode features Love Will Keep Us Together by Captain and Tennille. Mr. L's Old Days from January 25, 2019. This episode features Brandy by Looking Glass and Mandy by Berry Manilow. Mr. L's Old Days featuring songs by former Beatles Paul McCartney and Ringo Starr.